A. Landlord is the owner of certain real property lo­cated in the City of _________, County of _________, State of ___________, more particularly described in Exhibit A, attached hereto and incorporated herein by reference thereto (herein­after called the “Property”). The Property is part of a certain strip shopping center to be constructed by Landlord and to be known as the “_____________” and referred to herein as the “Shopping Center,” and shown on Exhibit B attached hereto and incorporated herein by reference thereto. 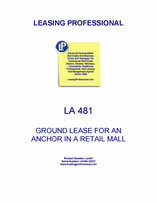 B. Tenant is in the business of owning and operating retail stores under the name and style “__________.” Tenant desires to lease the Property for the purpose of constructing thereon a ______________ type retail store containing approxi­mately __________ square feet as part of the Shopping Center. Landlord is willing to enter into such a lease with Tenant. C. The parties contemplate that the lease between Landlord and Tenant will be a lease of the ground, with Tenant assuming responsibility for and in connection with construction, maintenance and operation of improvements to be placed thereon and with Tenant to retain fee title owner­ship to all improvements placed by Tenant upon the Property during the term of the lease and any extensions. The parties agree that covenants which allow Landlord to control and exercise a right of approval over the exterior appearance of improvements placed upon the Property by Tenant are provided for the preservation of Landlord’s security and for the beneficial use and enjoyment of the Shopping Center as a commercial center but that such covenants shall not be construed as vesting in Landlord an ownership interest in the improvements. D. The improvements are to be constructed by Tenant in connection and concurrent with construction by Landlord and others of certain improvements in the form of retail shop space and common areas. This Lease, and the agreements of Landlord and Tenant set forth herein, shall be effective as of the date hereof. The “Initial Term” of this Lease shall commence on the earlier of (i) the sixtieth (60th) day following comple­tion by Tenant of the building and improvements described in Article 9.B. (the “Improvements”), or (ii) the date on which Tenant opens for business in the Improvements. The Initial Term shall end on the 30th day of June next immediately succeeding the twenty-fifth (25th) anniversary date of the day of commencement subject to the rights of extension hereinafter set forth. Tenant shall use its best efforts and due diligence to open for business by __________, 19__. B. Limitations Upon Commencement Date. In no event, however, shall the Initial Term of this Lease commence between November 1 and March 1, or March 10 and June 30, or August 1 and September 30 of any year, unless Tenant elects in writing to commence the Initial Term between any of such dates, or unless Tenant first opens the Improvements for business between any of such dates. C. Last Date for Commencement of Initial Term. Anything contained in this Lease to the contrary notwith­standing, in the event the Initial Term hereof and the rental obligation of Tenant has not commenced in accordance with the provisions of this Article 2 on or before __________, 19__, this Lease shall automatically terminate. D. Options to Extend Term. (1) Provided that Tenant is open for business (subject to Tenant’s right to close all or a portion of the Premises due to damage, destruction, condemnation, and other causes beyond the control of Tenant) and is not in default hereunder at any time an option to extend is exercised, Tenant may extend the Initial Term hereof for eight (8) additional periods of five (5) years each (the “Extended Terms”) by giving Landlord written notice of an irrevocable election to so extend not later than one (1) year prior to the expiration of the Initial Term or the current option period as the case may be. All of the terms and conditions of this Lease, except the right to further extend the Term hereof, shall apply to such Extended Terms so far as applicable, and reference herein to “Initial Term” shall be deemed to include the Extended Terms unless the context clearly implies to the contrary. Failure to exercise the option for any five (5) year period shall nullify all options for all subsequent periods. (2) If any of the foregoing options is exercised, each party shall, at the request of the other, execute and acknowledge a short-form extension in recordable form, acknowledging the fact that the option has been exercised and otherwise complying with the requirements of law to give constructive notice on the official records of the extended term. (3) In the event that Tenant shall not elect, or shall not be entitled to exercise any option to extend, Tenant agrees to join with Landlord in executing and acknow­ledging an instrument of termination in form suitable for recording on the official records, to be effective upon the effective termination date of the original or Extended Terms of this Lease, except that if Tenant shall hold over with the consent of Landlord, as provided in Article 10 hereof, the termination agreement shall be made effective as of the effective termination date of such holding over.